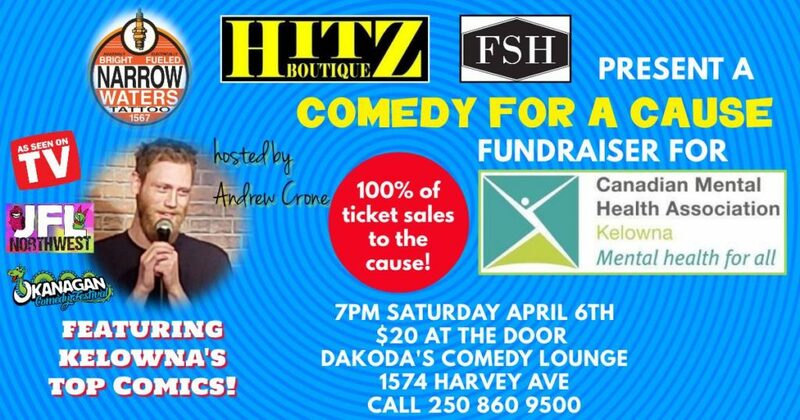 Narrow Waters Tattoo, Hitz Boutique, and FSH proudly present Comedy for a Cause at Dakoda’s Comedy Lounge to raise funds for CMHA Kelowna. This show will be hosted by Andrew Crone (JFL NorthWest, Shaw TV, Okanagan Comedy Festival) and will feature eight of Kelowna’s top comics. There will be door prizes, raffles, and a night of great comedy with 100% of ticket sales going to mental health programs and services in our community. Tickets are a minimum $20 donation at the door! Anxiety disorders are the most common form of psychological distress reported by children and youth, and can interfere significantly in their lives. An anxiety disorder is a level of anxiety that interferes with daily functioning, either with peer relationships, academic performance, or in family routines. Children/youth with anxiety disorders are shy, inhibited, and avoidant; parents and family members are typically very good at identifying anxiety in children but may not use the most effective interventions to support children and youth. This is a FREE event. Space is limited and registration is required. NOTE: THIS EVENT IS NOW FULL. ONGOING REGISTRATIONS WILL BE SENT TO THE WAITLIST. YOU WILL BE NOTIFIED BY EMAIL IF YOU ARE MOVED FROM THE WAITLIST TO THE ATTENDANCE LIST. If you are registered and can no longer attend, please send us an email so we can move someone over from the waitlist.